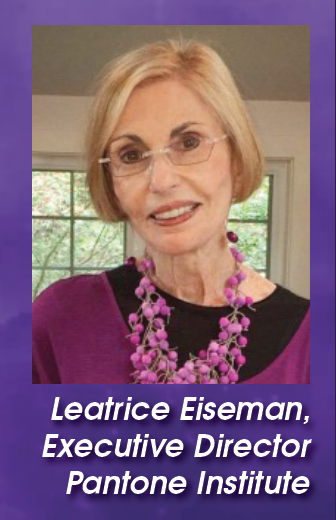 On Tuesday, May 8 from 8:30 – 9:30 a.m. Leatrice Eiseman, the Executive Director for Color Information and Training and the Executive Director of the Pantone Institute, will talk about Focusing on the Future: An In-Depth Look at the Leading Color and Design Trends in room B312 at Coverings. 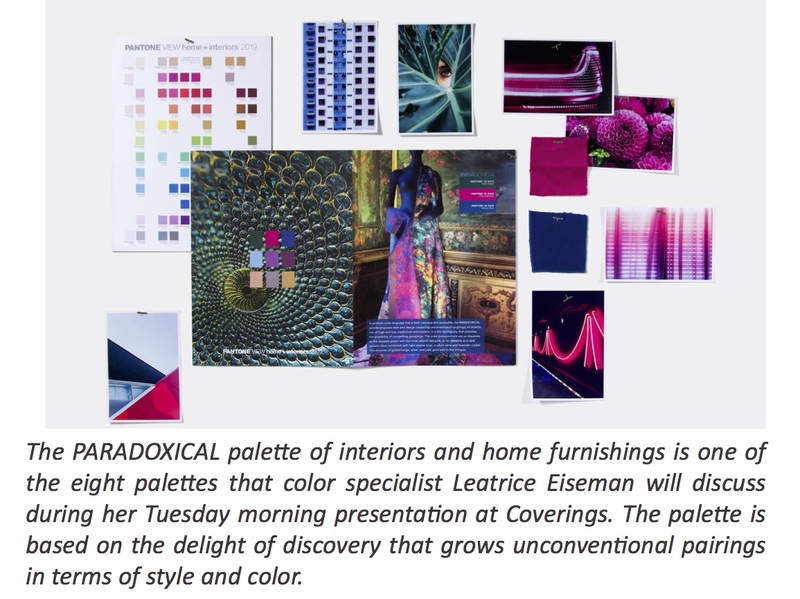 Eiseman, a color specialist who has been called “the international color guru,” will use The PANTONEVIEW home + interiors 2019 annual trend forecasting tool as a basis of her talk. This tool is developed specifically for the home furnishings and interiors market by the Pantone Color Institute. 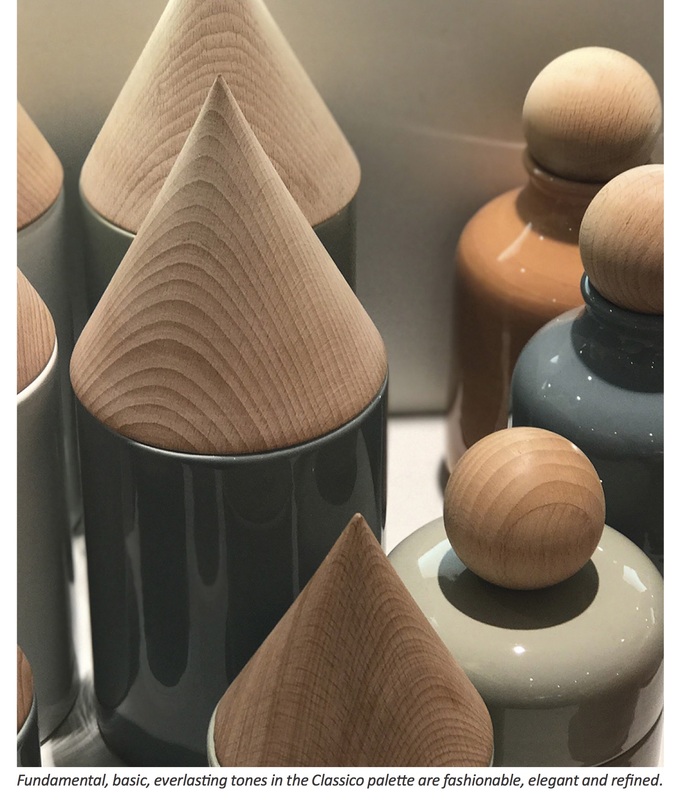 Containing visual inspiration, key color direction and suggested harmonies, the theme for its 2019 forecast is FOCUS and showcases 72 colors distilled into eight palettes that you’ll see in interiors a year ahead. 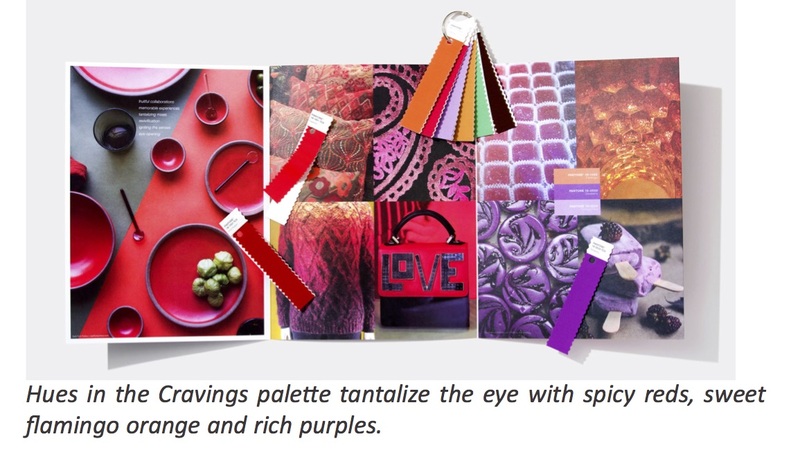 CRAVINGS tempts the eye as well as the taste buds with spicy reds, sweet flamingo orange and rich purples. Seductive allusions to “fetish foods” deepen the irresistible message of the palette. The neutrals of tasty Butterum and Cappuccino serve up a delectable warming presence, while grassy green promises a cooling respite from the heat of the surrounding shades. These exceptional flavors will draw upon memorable sensory experiences to inspire new ones that will be just as pleasing. CLASSICO hues are fundamental, basic and everlasting, while at the same time, elegant and forever fashionable. This is the palette where a graceful swan white and camel-colors can co-exist effortlessly with deep teal, chic gray flannel, burgundy red and caviar black. Rich gold and apricot brandy provide finishing elements to a color language spoken worldwide, across product categories and throughout all levels of the marketplace. 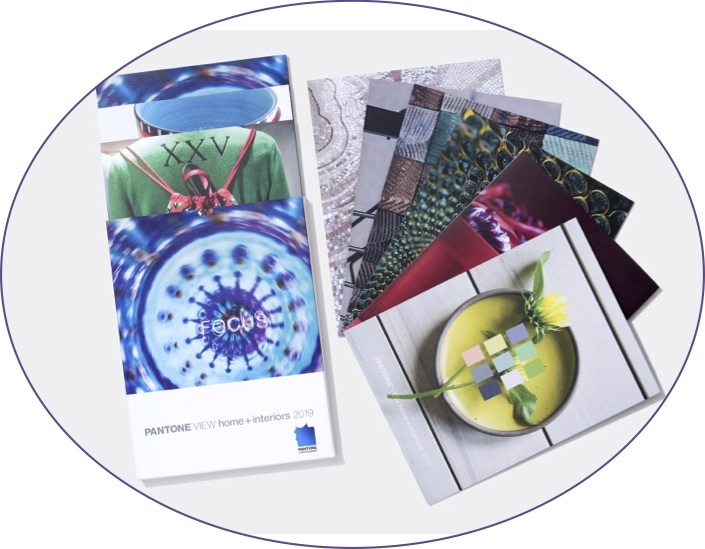 For more information about the PANTONEVIEW home + interiors 2019 tool, visit http://bit.ly/2HvrrMg. I’m looking forward to another great Coverings this year in Atlanta! 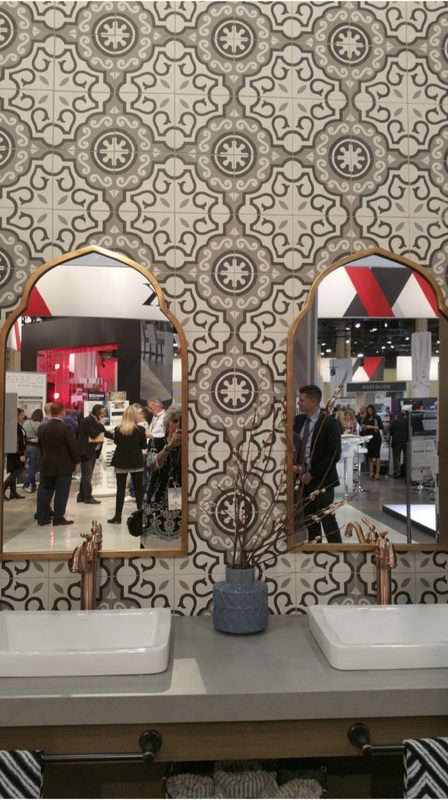 Not only am I excited to see all of the new products and amazing tile displays, but there are a lot of exciting events to check out on the show floor! New this year is the Installation Experience, where you will be able to learn about installation best practices, tips to make your projects shine, find out what you need to get certified, and watch an installation competition in this beautiful and dynamic exhibit. This year also will include extended show hours on Tuesday May 8th (with some fun networking opportunities as well), and the Orientation Theatre, which will help you get the info you need and make the most of your time at the show, as well as suggestions for tackling the show floor. The Coverings mobile app will also include a new feature: what “new products” are available to see on the show floor. 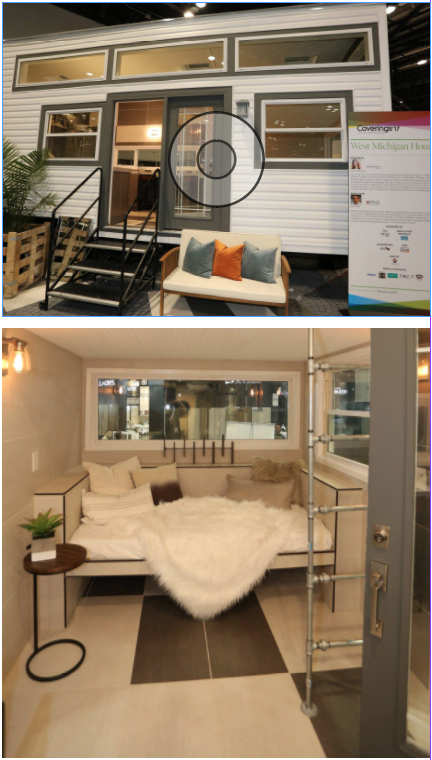 In addition to so many exciting new things, there are some Coverings favorites returning this year, like the Installation & Design Showcase, where we will see three Tiny Homes built live at the show! 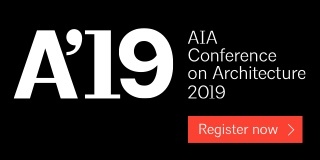 There will also be Audio Tours, the Coverings Connect lounge, Live Installation Demos, and the Stone Zone. I’m so excited for the show’s return to Atlanta, one of my favorite cities for sourcing design products for my projects. There’s so much to see and do in Atlanta, including the Coverings Celebration, tailgate style, at the College Football Hall of Fame! Get your tickets and have some fun celebrating at the end of this year’s Coverings, in your favorite sports team attire! Looking forward to seeing you at this year’s show! 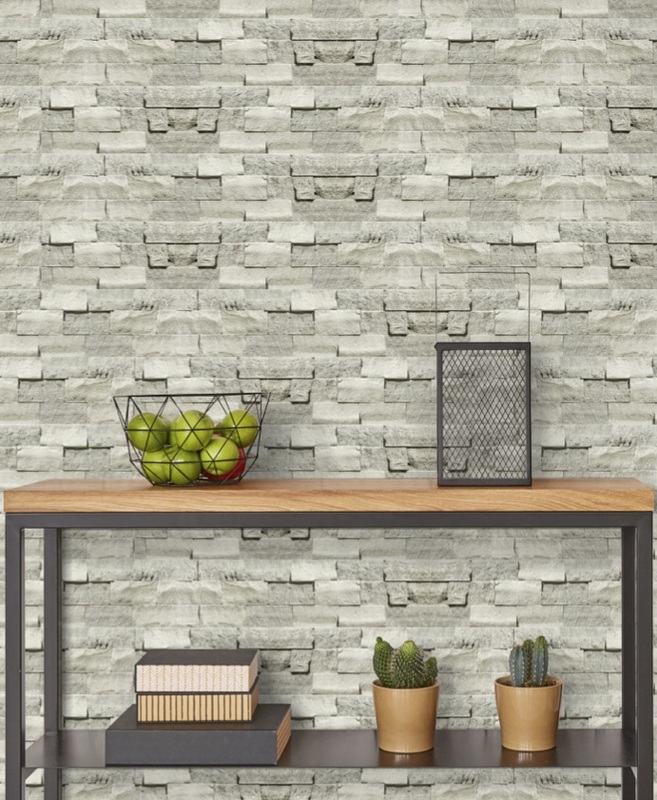 The new Java Joint porcelain tile collection reflects the trend toward the warming of neutrals, as well as the popularity of bold, linear striations. The line’s five hues are an arsenal of on-point colors, punctuated with the movement of luxe striations. 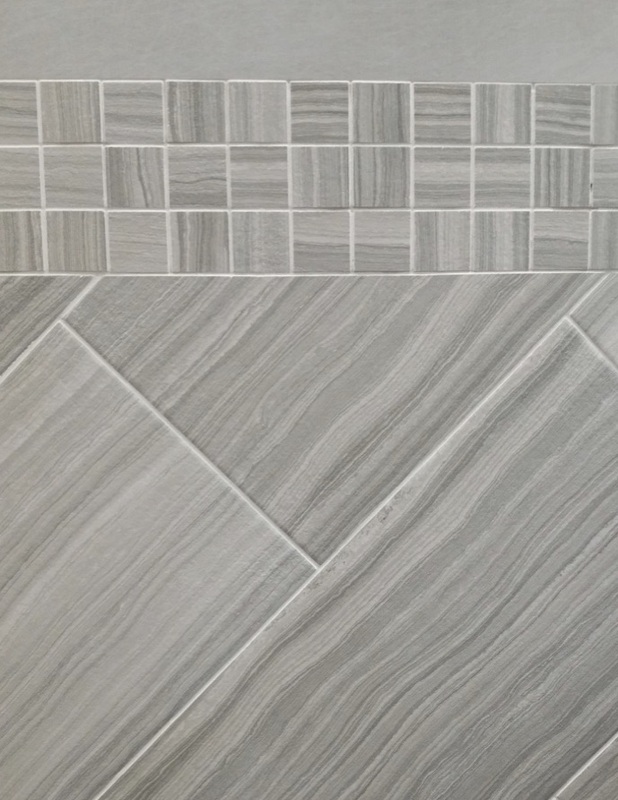 The line comes in a 12” x 24” field tile, 2” x 2” mosaics, and a full trim package, and is suited for walls and floors in commercial and residential applications. Embodying the latest trends in tile including large-format dimensional wall tile and wood-look porcelain planks are Motif and Porch. 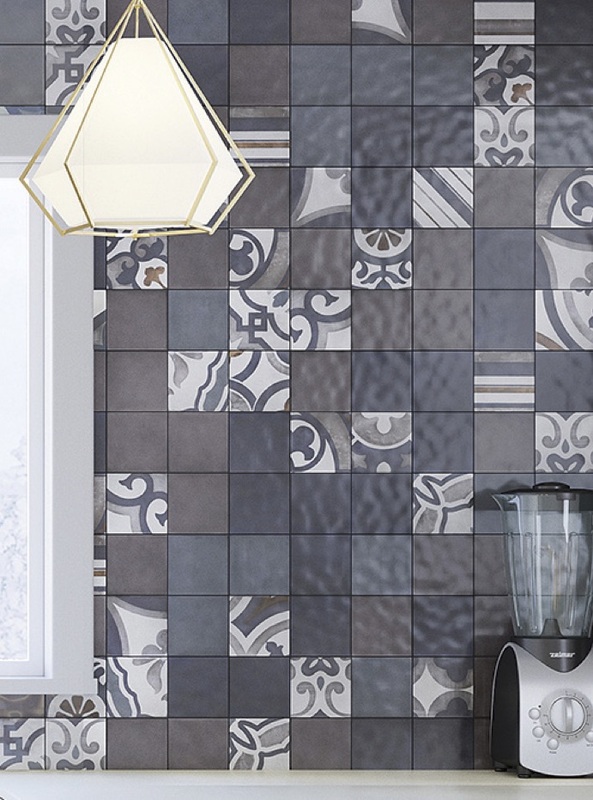 With Motif, a delicate lace overlay defines this glazed ceramic subway tile collection. Featuring a selection of neutrals, the collection’s understated texture and glossy finish combine to create a unique aesthetic. Porch (shown, in Coffee) features subtle wood grain movement with caramel- and coffee-inspired tones and provides color variation on interior and exterior floors, walls, and fireplace façades. 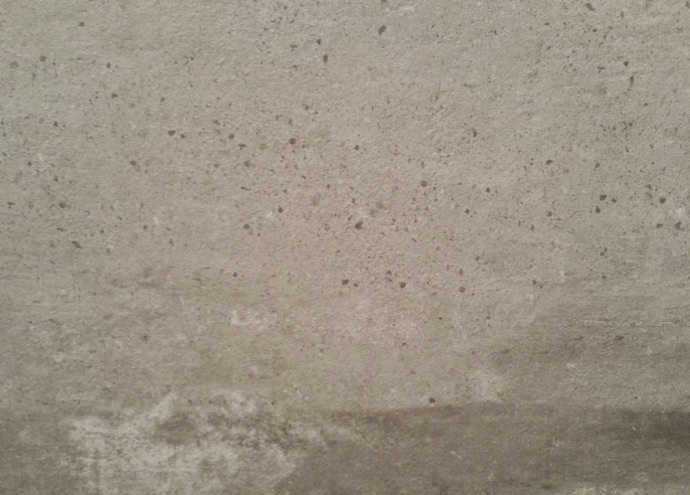 An understated satin finish completes the glazed porcelain tile for visual depth. 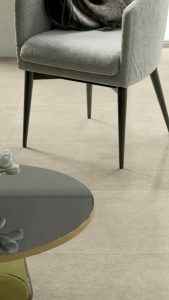 Responding to the on-trend demand for the cement look, Florida Tile NY2LA HDP features compelling characteristics of cement and plaster fused into a porcelain representation of urban sophistication. 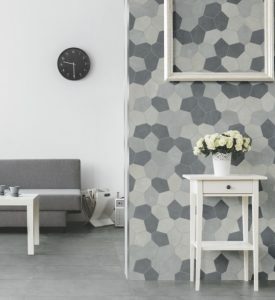 Origami Field is a collection of glass field tiles that reflects the iconic Japanese art of geometric paper folding. 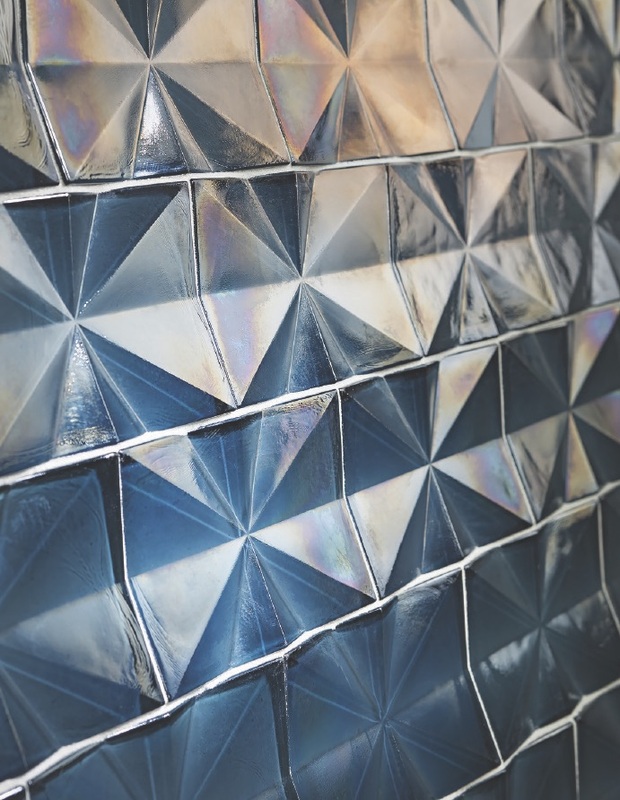 Featuring nine opalescent colors and three-dimensional shapes, the distinctive glass tile designs play with light and shadow. 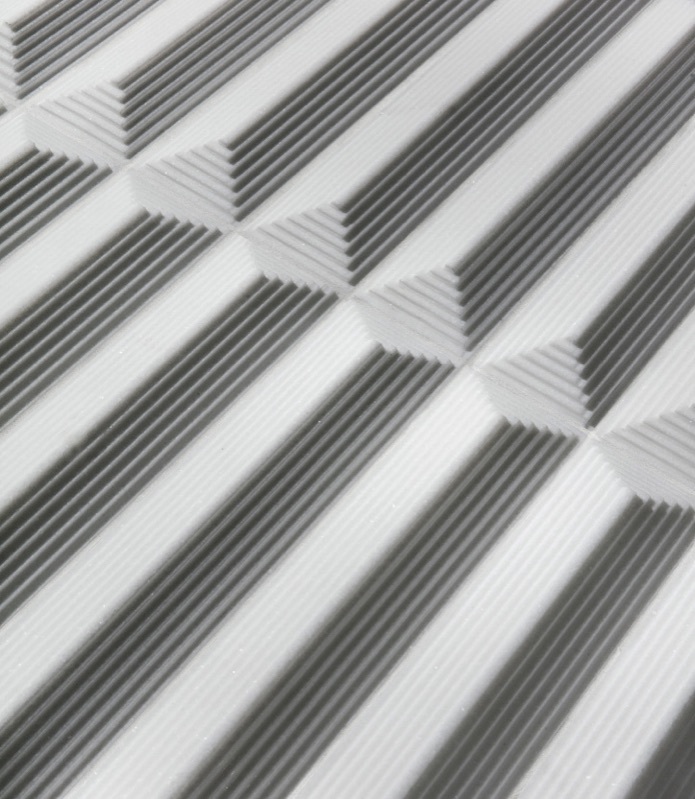 Origami Field comes in six shapes – Moxie (shown), Verve, Trapeze, Lacuna, Elation and Ambit – each with a unique pattern that emerges both visually and dimensionally. Origami Field is an extension of Lunada Bay Tile’s Origami line, which also includes mosaic tiles in four patterns and eight colors. 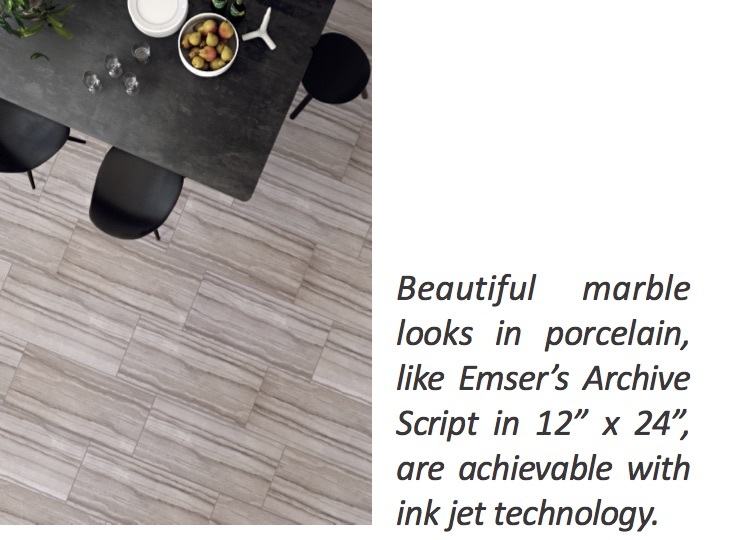 Marazzi’s D_Segni™ offers a vast assortment of encaustic-look tiles that bring energy to any room. D_Segni’s decorative designs range from geometrical, vintage and metropolitan patterns that can be used individually or mixed-and-matched for personalized designs, providing a bohemian romance feel. Seven coordinating solid colors are also available to complete the look. Organza conveys a contemporary fabric/linen interpretation. 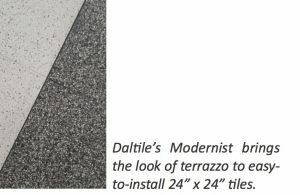 Three surface options available – natural, semi-polished/lappato, and outdoor/anti-skid – with four complementary field sizes, from wall to large- format floors – 2” x 2”, 4” x 24”, 12” x 24”, 24” x 24”, and 24” x 48”– to accommodate any environment. All sizes are color-body and rectified. As we prepare for Coverings in Atlanta, be assured that we will see a large turnout of buyers since the economy is strong and the show will be full of factories from around the globe showing their newest products and innovations for 2018 and beyond. First, let’s look at what’s selling and how it may evolve into newer generations of that style. Remember, a trend is a pattern of gradual change that we see in the industry and not a “one-hit wonder” that fills a niche and is not a broad selling category. We have seen those come and go in our industry, but this article focuses on solid trends. Ink jet has changed the industry and has taken us to a level of design no one could have imagined, and it alone has allowed us to continue to grow with the development of other floor coverings. 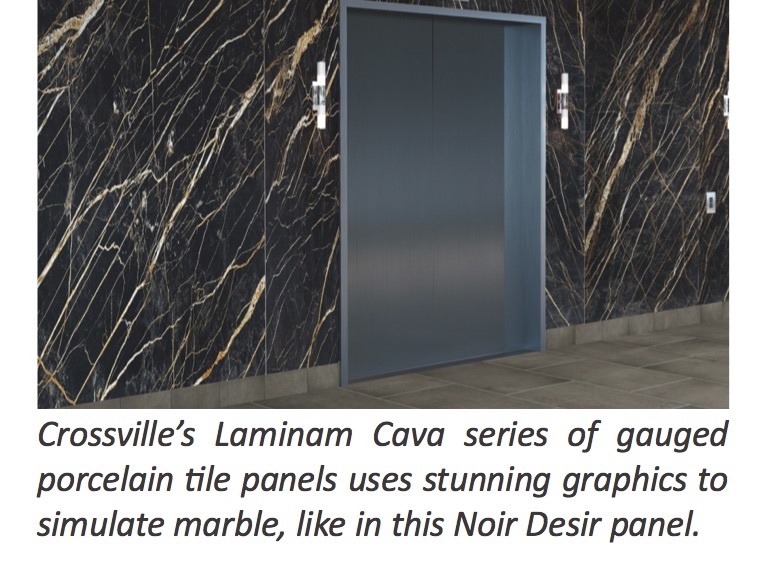 In addition, we see the large panels/slabs being promoted by manufacturers and distributors alike. Finally, we see the U.S. market being more accustomed to larger sizes from around the world, including 24″ x 24″ and 24″ x 48″. When we discuss technology, we cannot forgo the next step of some of these new products, which is how they are installed. We are fortunate to have industry associations and leaders such as Bart Bettiga (Executive Director of the National Tile Contractors Association), Eric Astrachan (Executive Director of the Tile Council of North America), and Scott Carothers (Training Director of the Ceramic Tile Education Foundation) that ensure our industry is focused on quality installation with certification programs such as the Certified Tile Installer (CTI)and Advanced Certifications for Tile Installers (ACT). The CTI credential certifies installers in basic installation knowledge and skills, and ACT certifies installers in seven specific areas: in setting large-format porcelain tile and subfloor preparation, mud walls and floors, showers and membranes, grouts and thin porcelain tile. 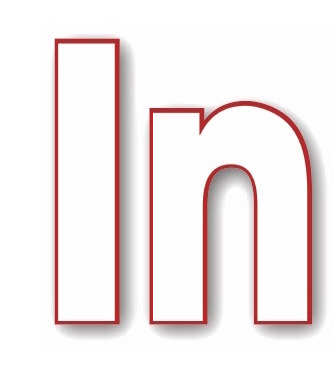 Rest assured, one of the categories in which we will see new introductions is wood. 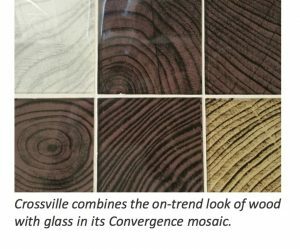 Wood has become a category on its own with some distributors saying wood looks account for 30%-40% of their tile sales. The question is, how many wood looks do you need to ensure you have the right mix and you limit the cannibalization? 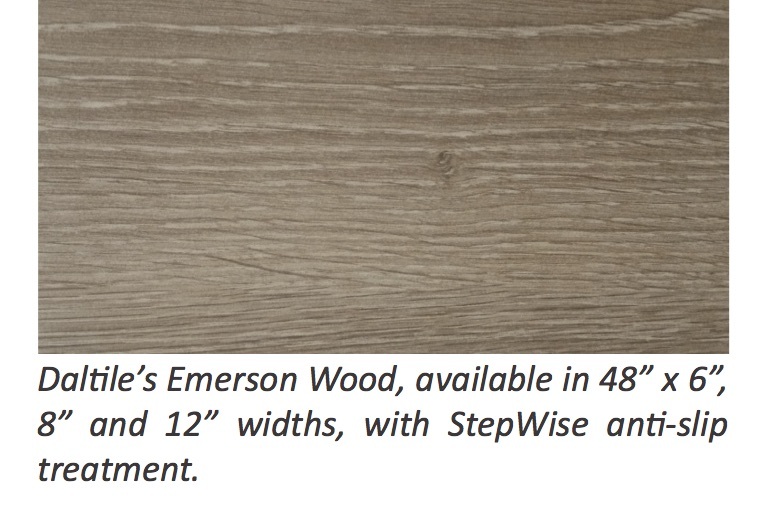 We have seen multiple new generations of wood looks that target both the residential and commercial market. 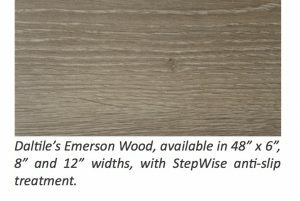 Ink jet technology has allowed us to emulate the look of real wood and we have the ability to press or cut plank sizes that we see in real wood. 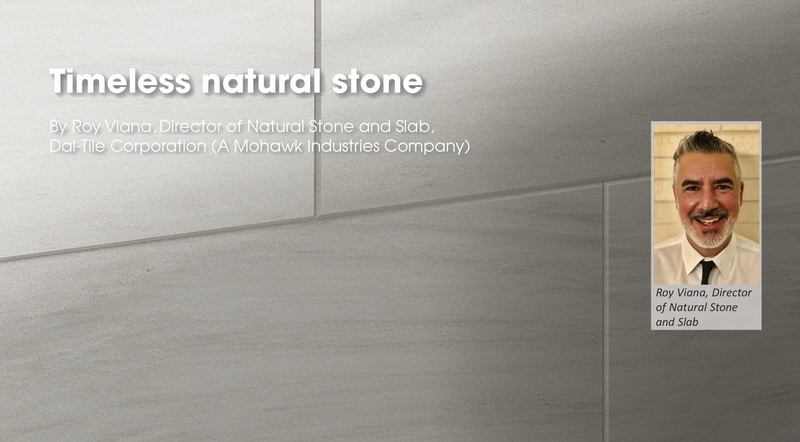 In addition, users love the differentiating factor that comes with tile, which is durability and ease of maintenance. 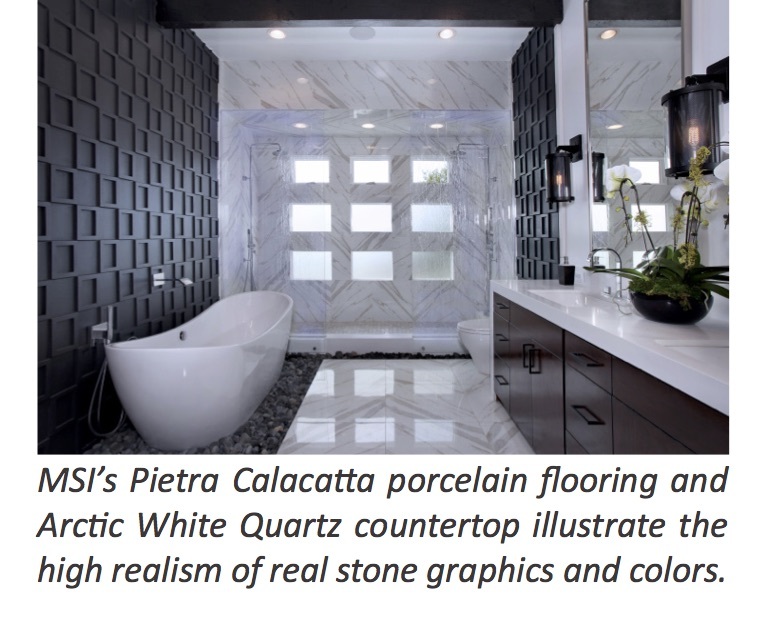 A trend that we see continuously evolving is the gauged porcelain tile panels (GPTP) and slabs. These products are manufactured differently from traditional dust-pressed tile with technology like Lamina or Continua machinery. 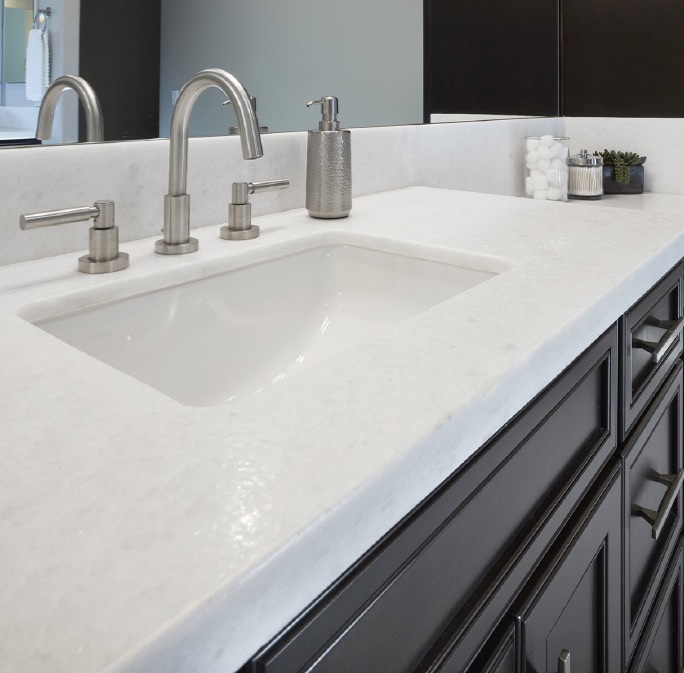 We have seen the thickness gauge of the products range from as thin as a 3mm to as thick as 30mm, the latter of which allows it to be used on countertops and compete with the traditional stone and quartz market. The beauty of the technology is that it allows you to get a wide variation in the graphic and retain the virtues of porcelain. 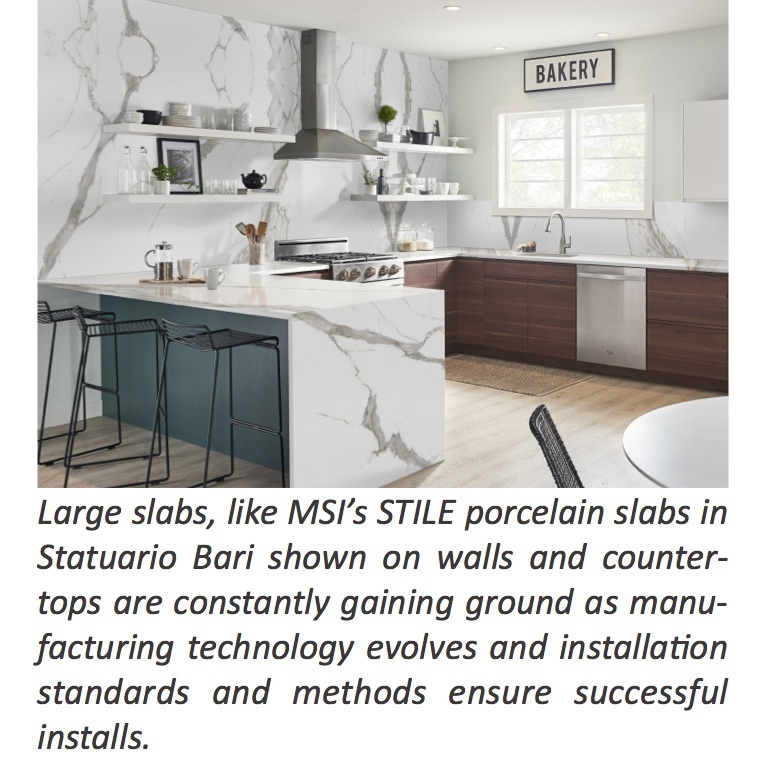 I believe as we train installers and our specifiers become more acquainted with it, we will see this material replace a portion of the countertop market as well as traditional wall coverings as consumers and designers look to differentiate their projects. 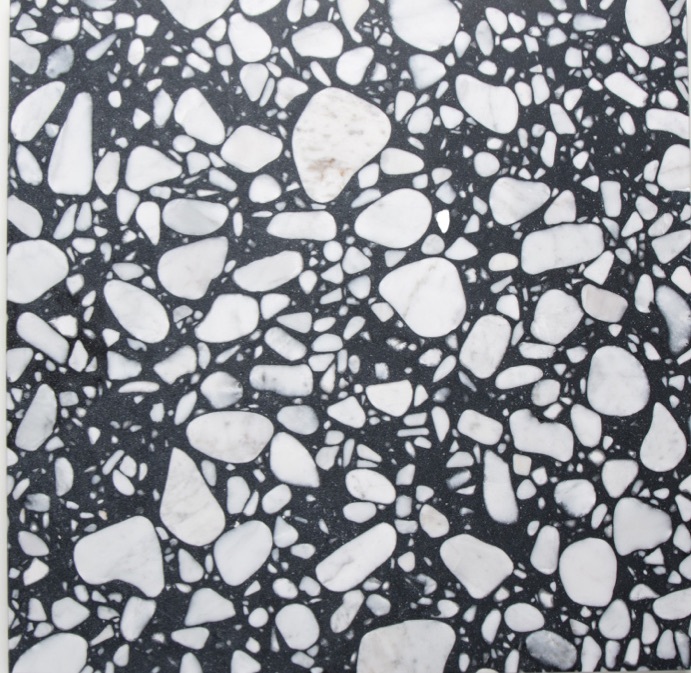 Terrazzo is a product we traditionally view as a competing flooring product to the tile industry, however, with the emergence of ink jet, manufacturers can now produce porcelain tile with the majestic look of real poured terrazzo. 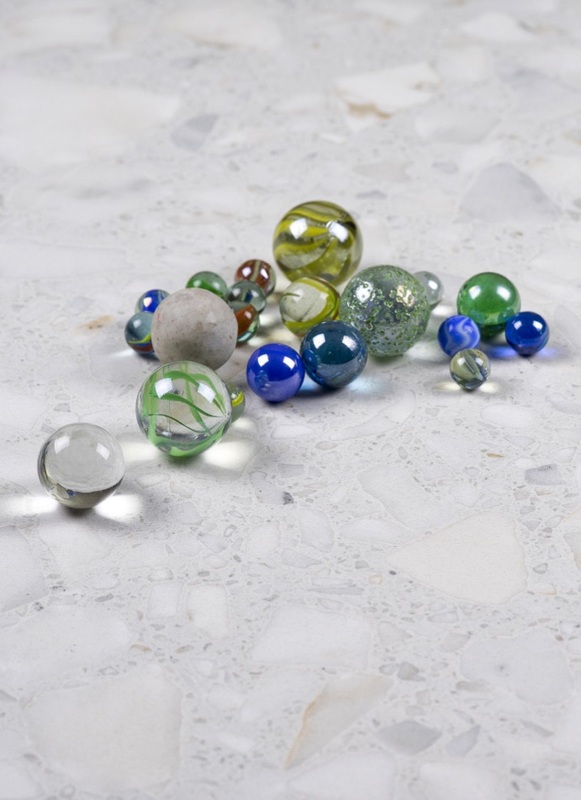 Porcelain terrazzo tile brings the benefits of porcelain with the visual of the real mixed product modeling embedded marble, granite, quartz or glass chips. Wow, this is one of my favorite products with the advances we see in ink jet technology! Again, the virtues of porcelain combine with the beauty of marble curated from around the world. In addition, porcelain provides the ability to perfect a finish from matte to honed and a perfect polish. 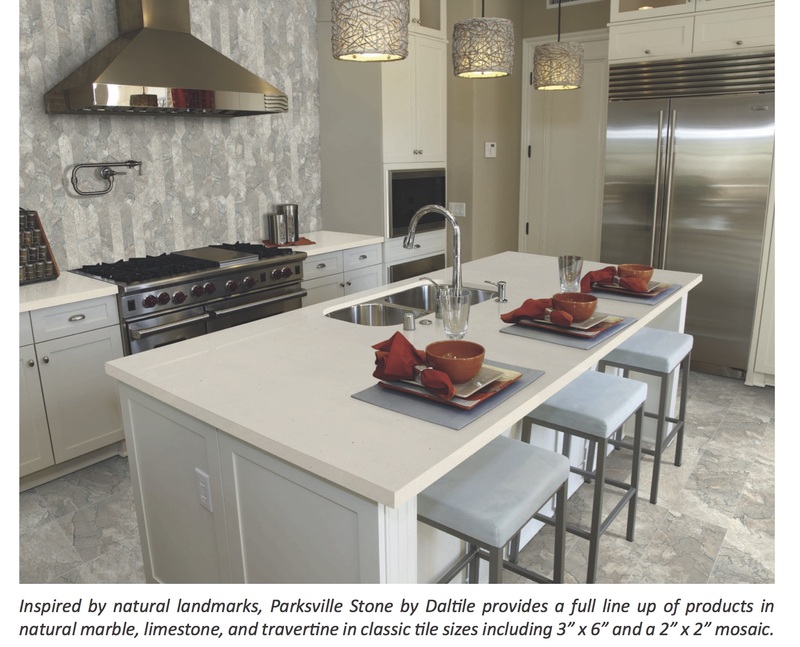 Tile now rivals the beauty of real stones’ intricate veining and realistic color palettes. 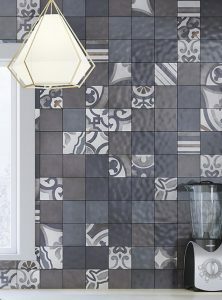 Manufacturers have reproduced traditional hand-made encaustic cement tiles, which evolved in the 13th century. The look allows you to romance a space with designs that vary from classic, geometric, and metropolitan patterns that can be used individually, or mixed. Cement looks aren’t new, but they continue to trend higher with each new generation of product, from the conventional concrete to refined visuals. 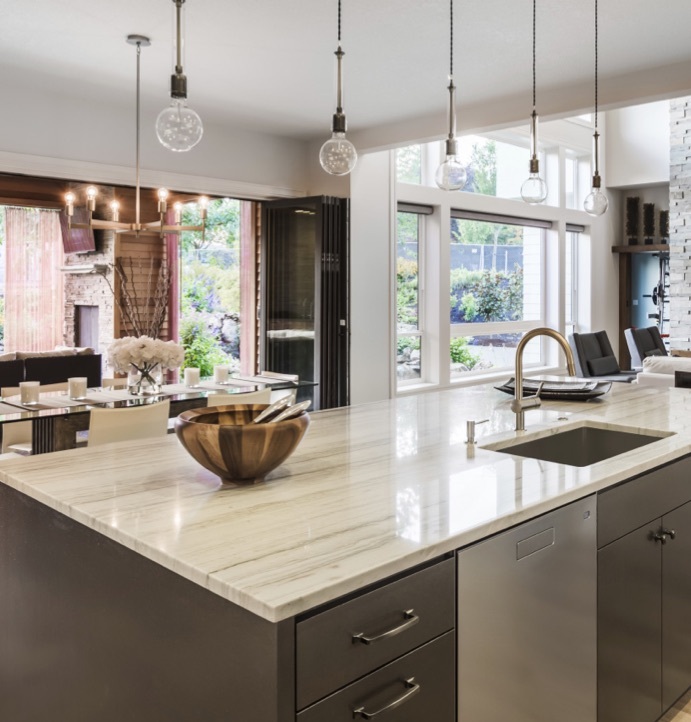 Consumers and designers love the industrial look, and cement visuals lends themselves to the growing design trend of more modern or contemporary looks. 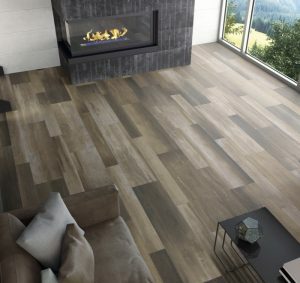 Manufacturers have and will continue to evolve this style with new textures, formats and colors replicating the stained, stamped, and polished effects to create a much more classy and enduring floor. Glass is here to stay and continues to mature, utilizing the ever-popular ink jet technology. In addition, we will see new sizes and shapes (manufactured via casting, pressing and slumping) with colors that add translucency and a shimmer to an installation. We see glass as what makes a room pop and catches the eye of everyone who enters it. 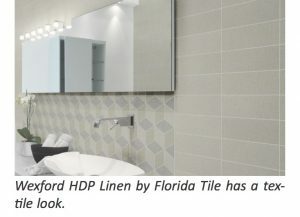 Fabric in tile? Yes, we have seen some manufacturers take it to the extreme of emulating tartan patterns while others focus on simple woven patterns. This allows us to displace the growth of carpet tiles in lieu of a porcelain tile that will have the benefits of easy maintenance and endurance of porcelain. Specifically, you’ll see rectangular looks that have evolved from the traditional subway tiles into larger sizes including 3″ and 4″ x 12″ tiles and even larger, and patterned tiles (domed, beveled, arched, and sculptural) that allow the usual monochromatic look to move into the next generation with endless design possibilities. 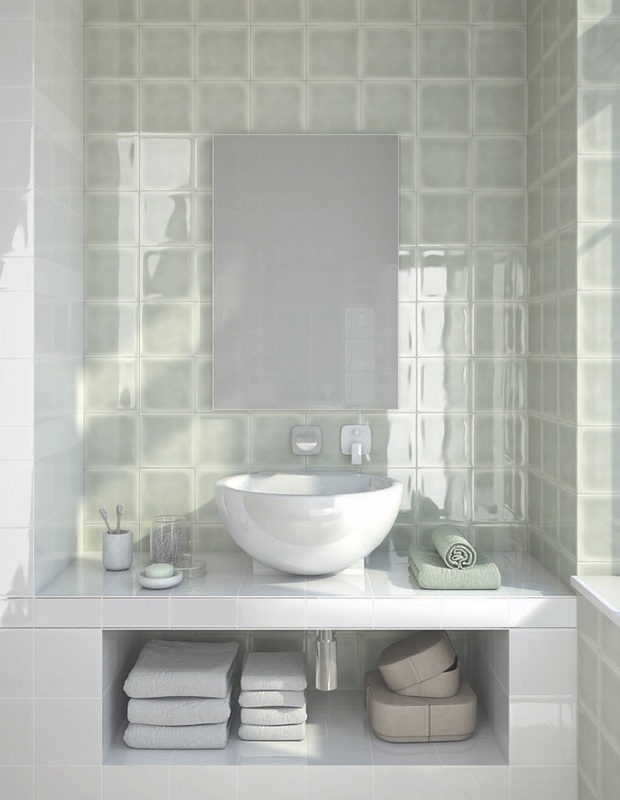 Furthermore, larger wall tiles including 12″ x 24″ sizes are becoming more commonplace. 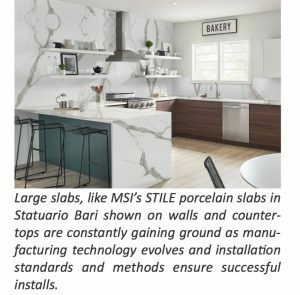 The rustic stone look still is here to stay as consumers love the appeal of natural stone, but not the maintenance and cost that accompany it. 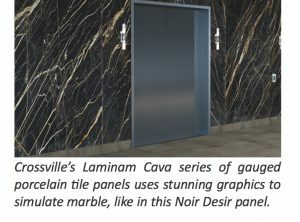 Manufacturers endlessly pursue new designs as we see the capability to create a tile with wide-ranging graphics has flourished, and has allowed us to see visuals emulating the real stone graphics and colors. Colors, what will we see? 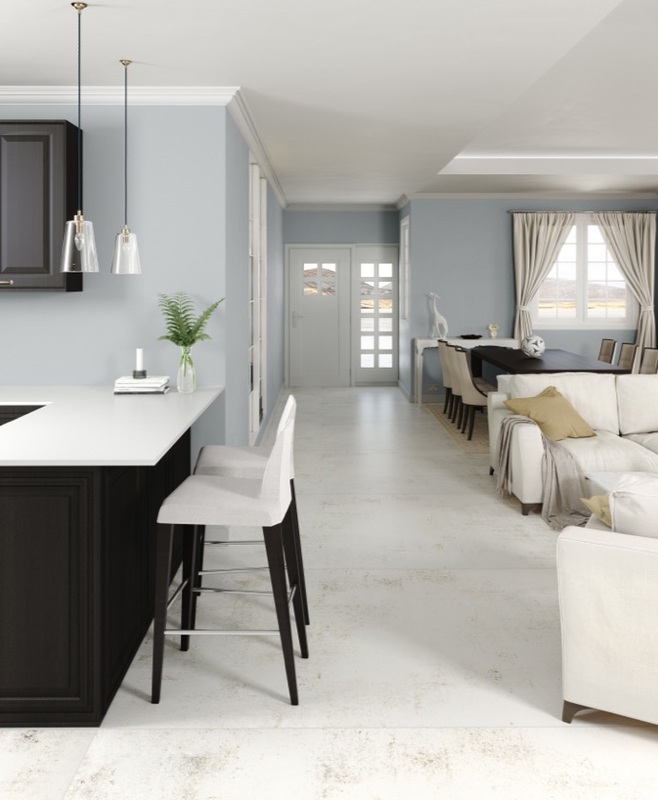 Yes, white, beige and grey – our industry neutrals will continue to be the “go to colors,” with a palette of warming tones, moody dark tones and warm creams. 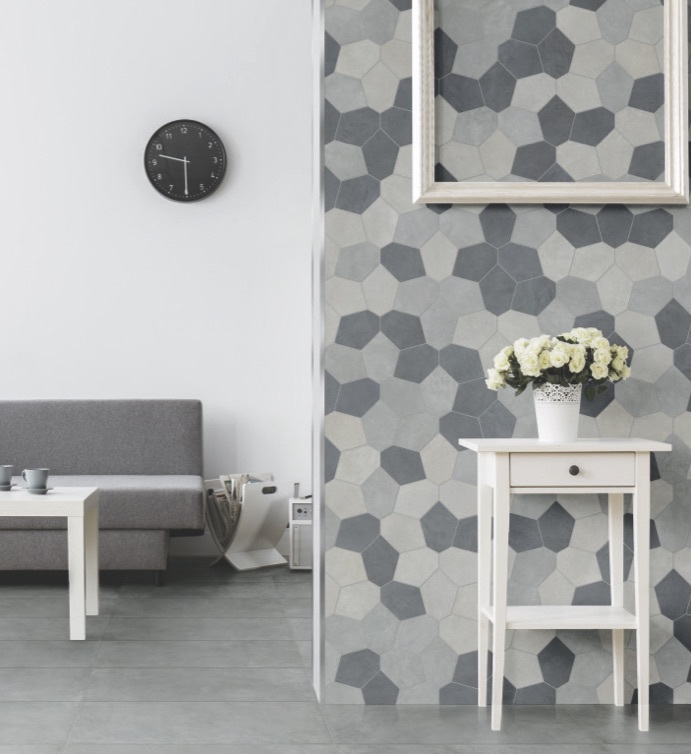 Some refer to neutral colors as any hue that doesn’t compete with other colors, yet ceramic tile typically involves a large space, therefore giving the eye the ability to flow from one point to the next without the distraction of a singular color. Furthermore, regardless of your design style, there is a place for neutral colors in your décor. Additionally, when feature colors are used in the room it enhances the “pop” more when amidst neutrals. 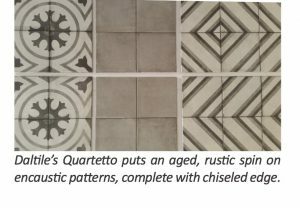 With the introduction of additional shapes and textures in the tile, industry neutral colors benefit these without becoming an eyesore. To reach Joe, phone 214-641-7773 or visit josephlundgrenconsulting.com. the fall of 2013, the Atlanta Braves officially announced that they were leaving Turner Field, their home of 20 years, and heading just north of the city to open a new baseball stadium – SunTrust Park. To kick off the $672 million construction project, the architectural firm, Populous, and general contractor American Builders – a joint venture between New South Construction, Brasfield & Gorrie, Mortenson Construction and Barton Malow Company – set out to design a Major League ballpark that captured baseball’s heritage and embraced the South’s traditional aesthetic. This would include nearly 150,000 sq. 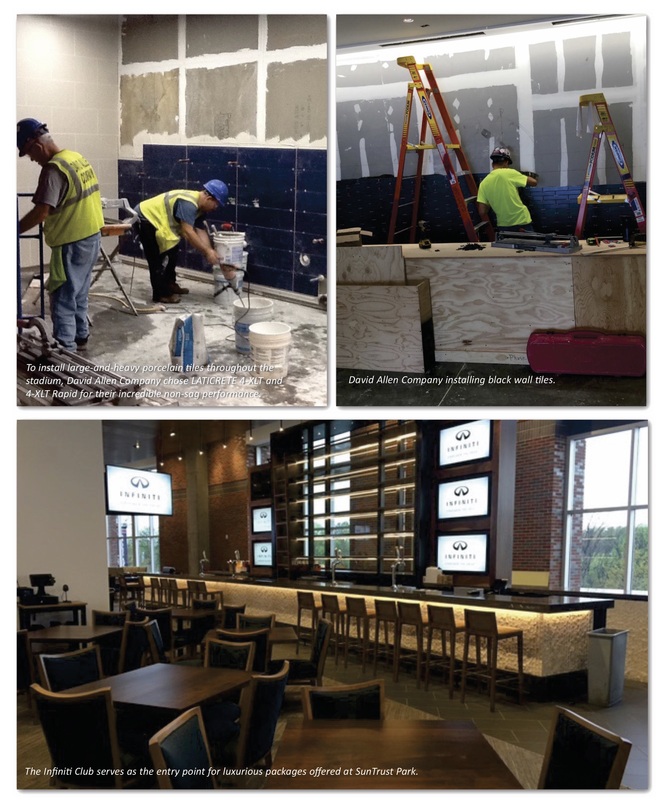 ft. (13,935 square meters) of tile, stone and glass installations throughout the ballpark in areas including the stadium kitchens, player locker rooms, the Delta Sky360° Club floor and the suite floors and backsplashes. Tight timeframe: Due to the fact the ballpark had an extremely aggressive schedule, David Allen Company provided the resources necessary to complete all installations in a five-month window. In order to be successful, each area of the project had to be constantly stocked with the correct setting materials and tile to ensure the team stayed on track and reduced any chance of inefficiency. Once an installation crew completed an area of work, the next area had to be ready to start immediately so as to not interrupt the flow of manpower throughout the stadium. 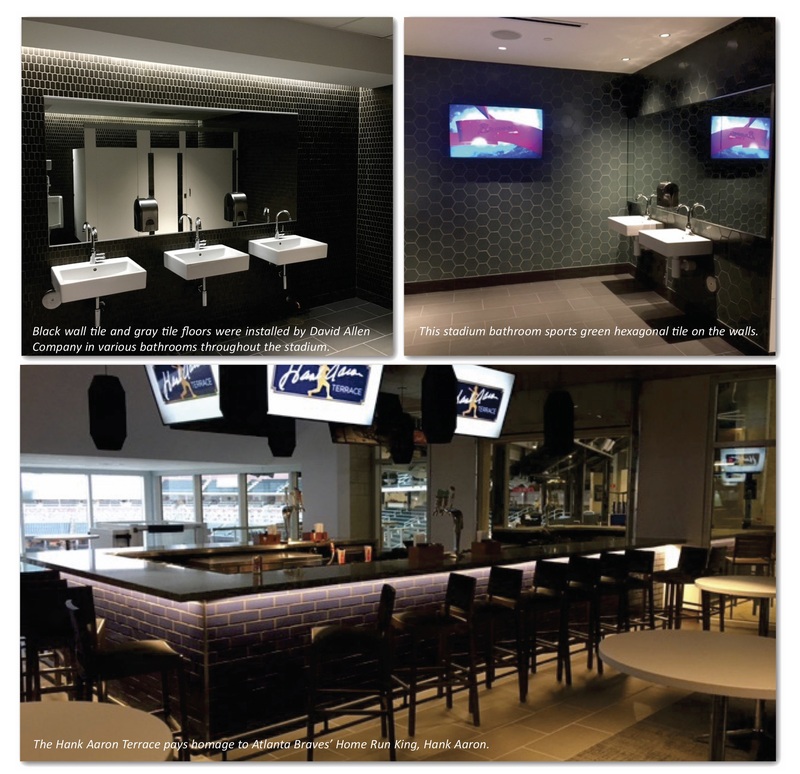 Plethora of materials: 60 different types of tile, stone and glass from all around the world were utilized in SunTrust Park’s design. The full line of products LATICRETE offers was key to being able to handle the various substrates encountered with ease. Before beginning any tile work, David Allen Company used NXT™ Level, a cement-based underlayment, to produce a flat, smooth and hard surface. Once cured, NXT Level is durable, fire- and heat-resistant, non-combustible and maintenance-free, making it the ideal product to be at the foundation of a busy ballpark. 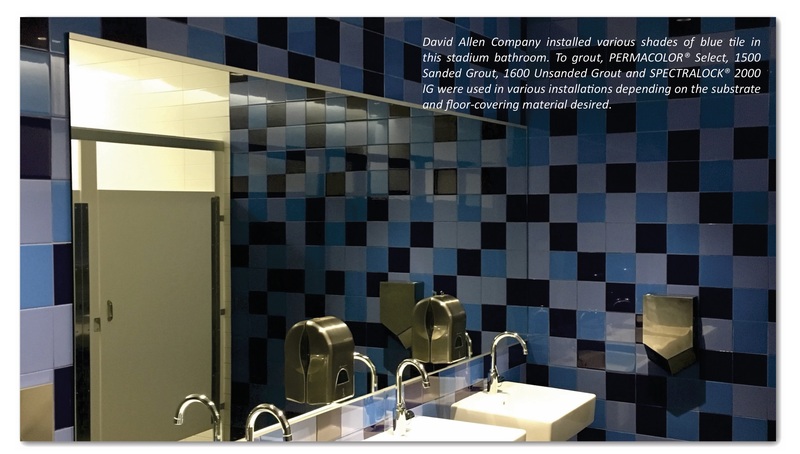 Because it was imperative that David Allen Company remain on a tight schedule to complete the entire stadium’s tile, stone and glass installations in five months, choosing LATICRETE products that saved time with rapid curing formulas and easy installation were of the utmost importance. For waterproofing bathrooms and showers throughout the player and staff locker rooms, David Allen Company trusted HYDRO BANⓇ and HYDRO BARRIER™ waterproofing products. These products allowed for a faster time-to-tile and foot traffic in as little as four hours. 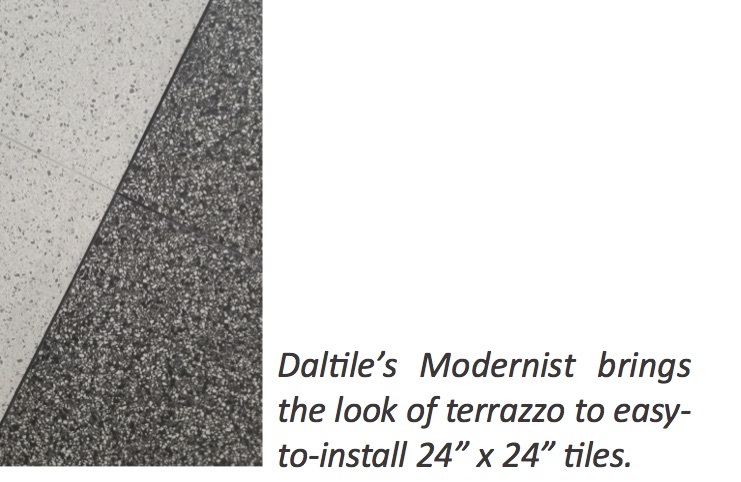 For use under traditional thick-bed installations of tile, 209 Floor Mud, a factory-prepared blend of high- strength portland cement and carefully graded sand, was chosen due to its pre-mixed packaging. This saved the team valuable time not having to blend portland cement and sand on the jobsite. 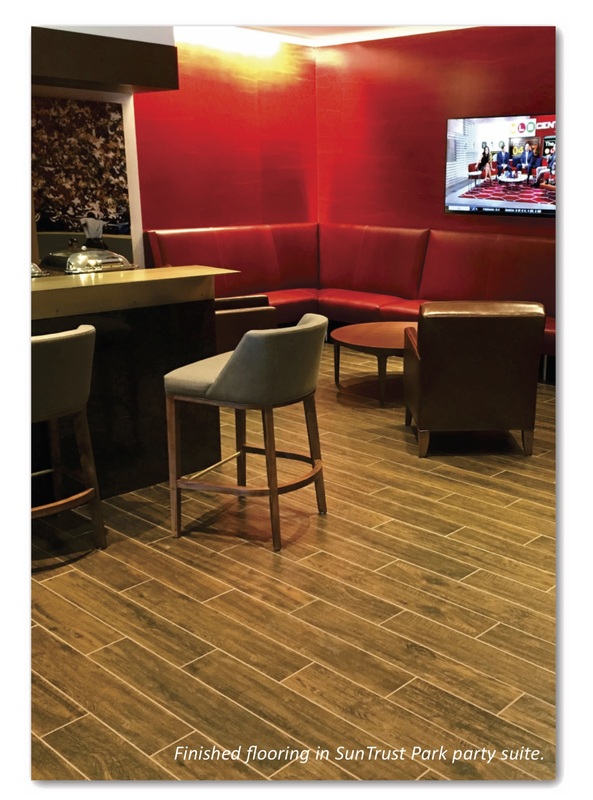 For interior and exterior floor and wall installations of ceramic tile, porcelain tile and stone applied on the stadium’s bar fronts and backsplashes, 253 Gold, a superior polymer-fortified bagged cementitious thin-set powder, was used. To grout, PERMACOLORⓇ Select, 1500 Sanded Grout, 1600 Unsanded Grout and SPECTRALOCKⓇ 2000 IG were used in various installations depending on the substrate and floorcovering material desired. These offered benefits such as time savings, crack-and-stain resistance, chemical resistance and enhanced durability. SunTrust Park creates a fan experience unlike any other, thanks to its perfect marriage of classic ballpark feel and modern amenities. The new stadium seats 41,149 fans and maximizes sight lines so that every seat feels like the best in the house. 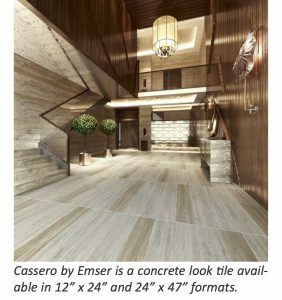 Architects and designers – have you ever experienced a project where the tile installation didn’t meet your expectations? If you have, and the issue was an installation failure or poor-quality appearance, I have good news. You can greatly reduce the chances of a repeat performance by selecting and working with qualified and certified professional installers. 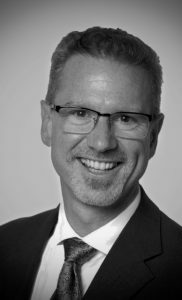 It is a fact that to be among the most successful sales professionals, extensive knowledge of the product and how it is best used is essential. 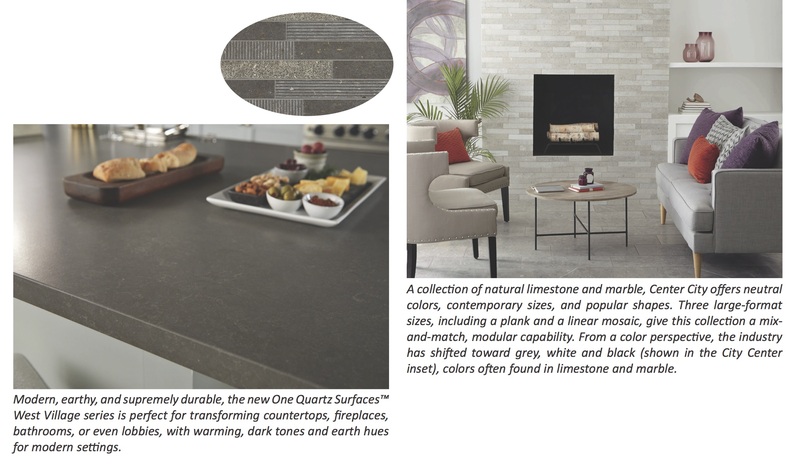 Since you design beautiful buildings and assemble timeless palettes of color and texture to enhance the spaces in which we live and work, I’d like to recommend that you seek out the true sales professional – one who has achieved Certified Ceramic Tile Specialist or CCTS for short. 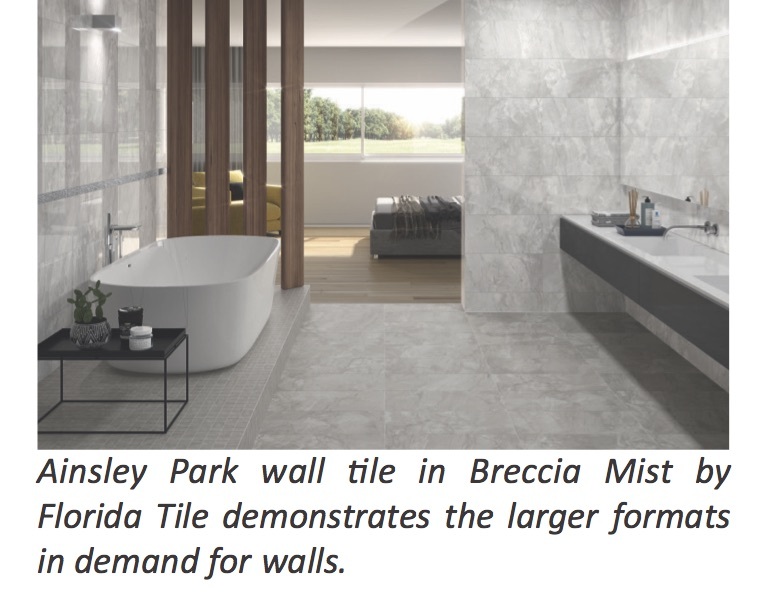 The individuals who have invested in this certification – established by the Ceramic Tile Distributors Association (CTDA) – have taken their role in the ceramic tile industry very seriously and have distinguished themselves among their peers. 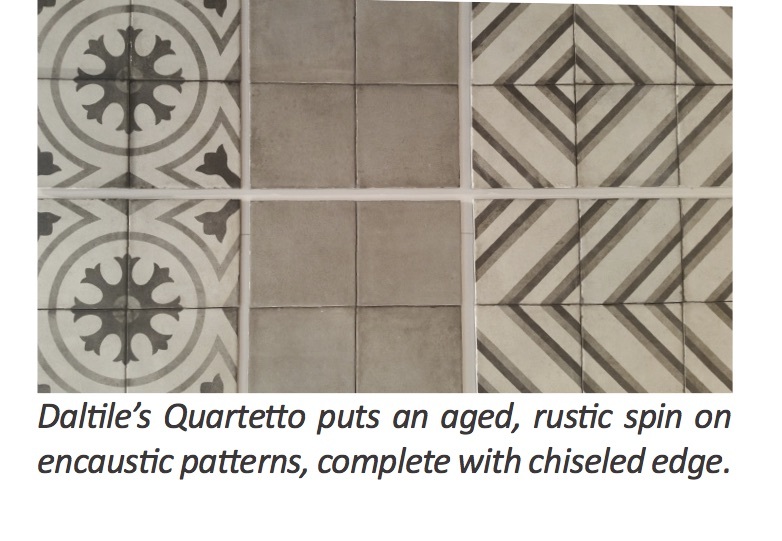 This certification requires extensive knowledge, not only of the rich history of tile, but the current methods of manufacturing the different types of tiles along with their physical and performance properties. A thorough understanding of all the applicable manufacturing and installation industry standards is also required to gain CCTS. The CTDA created and administers this certification to meet a critical need in our industry: the need for those selling and servicing the design and architectural community to be thoroughly knowledgeable of the different types of tile and their recommended use and proper installation. They also should understand all the industry standards that determine the quality of product and the allowable manufacturing tolerances, so they can assist you in making the best-informed choices for your projects. 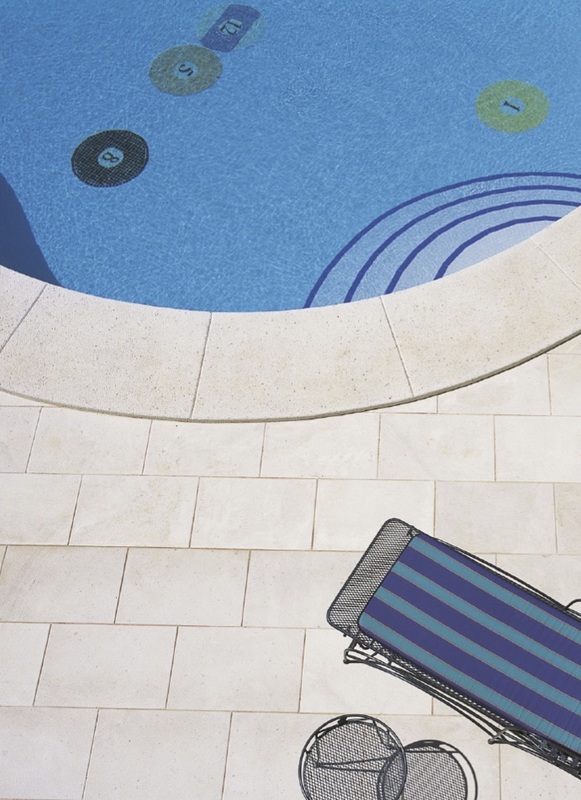 No one wants the unenviable experience of selecting the perfect color, size and finish tile only to see it installed and THEN learn that it does not have the proper slip resistance or abrasive resistance needed. 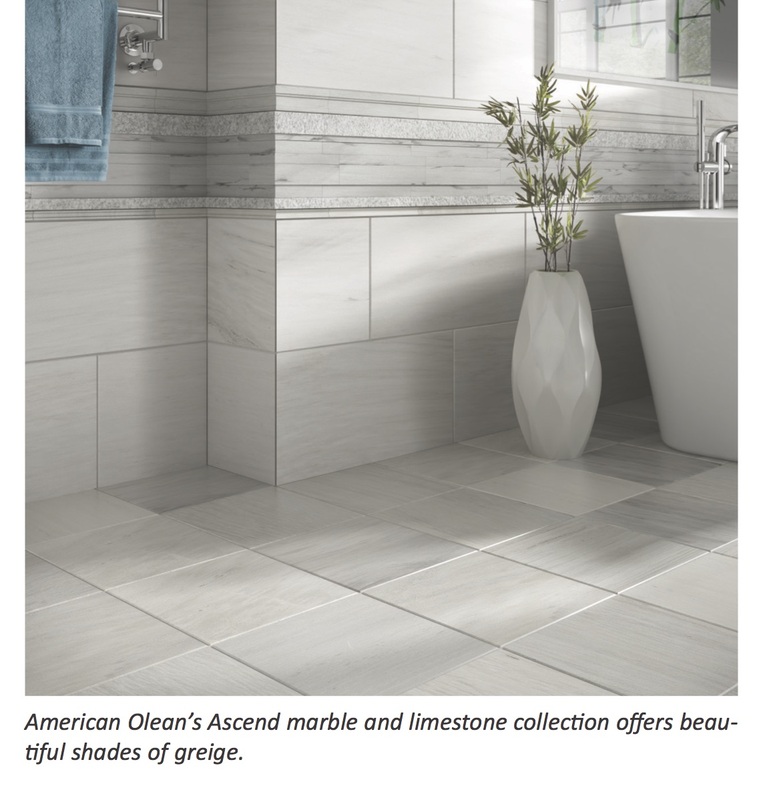 As an installation professional, I’m always surprised at how often I meet sales representatives who have experience in sales, but no knowledge of tile or the industry at large. This is why the CTDA created this much-needed certification. 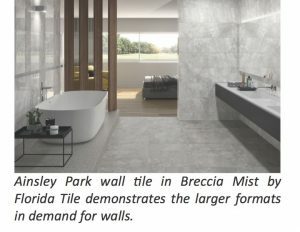 It is important that the person you rely on for advice about tile knows enough to give you professional advice about more than what colors and sizes are available in any particular series. I strongly recommend that distributors make a commitment to train their sales and showroom personnel to prepare to take the CCTS exam. This investment in their employees will undoubtedly improve company performance and profit. The knowledge they gain from taking the test will positively impact the installer, the consumer and the industry. 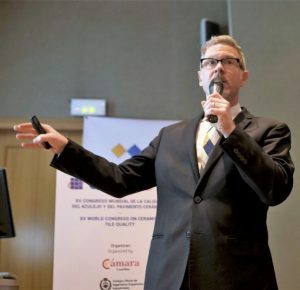 I encourage the design community to insist on working with CCTS professionals and I encourage all sales professionals to invest in the Certified Ceramic Tile Specialist credentials. Visit https://www.ctdahome.org/content/education/ccts.asp or the shortened URL – http://bit.ly/2u8Tmjd – for details on the program and a list of companies who have CCTS professionals. 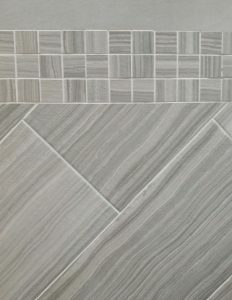 https://www.ceramictilefoundation.org/find-certified-tile-installers or http://bit.ly/2IGtXkr for Certified Tile Installers, http://www.tilecertifications.com/ for those installers who have been certified through the Advanced Certifications for Tile Installers exams in higher-level installation practices like grouts, large-format tile and substrate preparation, membranes, mortar (mud) floors, mortar (mud) walls, shower receptors and thin porcelain tile. The NTCA’s Five Star Contractors are required to employ CTIs and exhibit other marks of excellence to receive this distinction. Locate one under the Find a Member at the NTCA website, www.tile-assn.com or directly at http://bit.ly/2u79ba6. 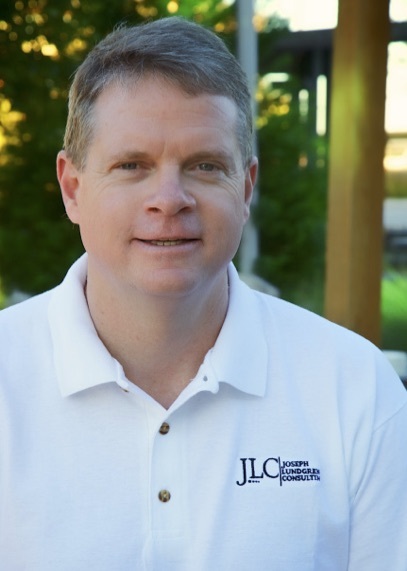 Other qualified setters and contractors have successfully completed Union Journeyman Tile Apprentice Programs, received TCAA Trowel of Excellence certification, or attended IMI Contractor College. Also see Scott Conwell’s story in this issue that supports the practice of connecting and working with quality installation companies. I hope we all work to leave our mark on history, by creating timeless quality installations that will inspire for generations to come. 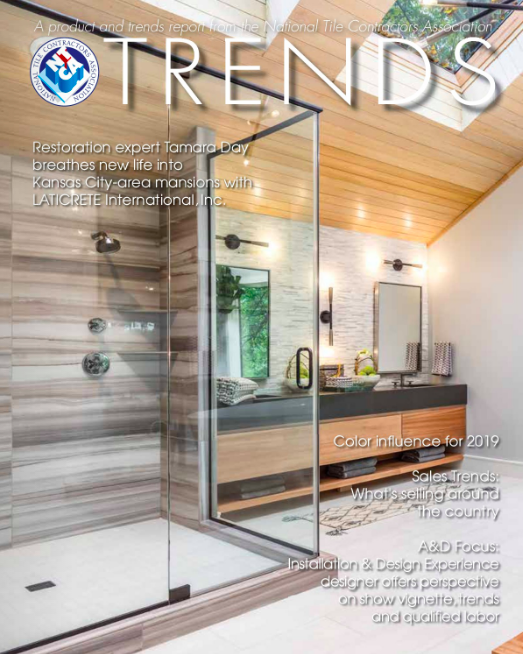 It’s hard to believe that this is the fourth year of Tileletter TRENDS, since we kicked off this annual publication at Coverings ’15. 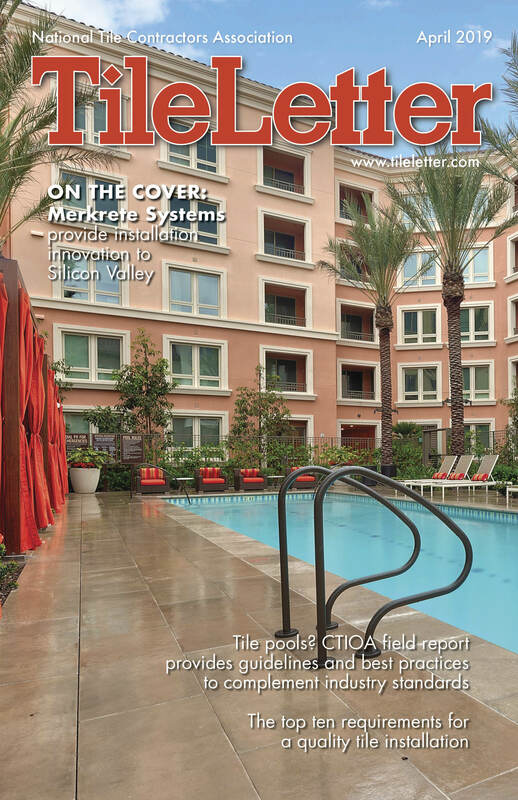 This issue is always one of my favorites, with a panoply of products to ensorcell and inspire and to make tile and stone installations easier, faster or better performing. 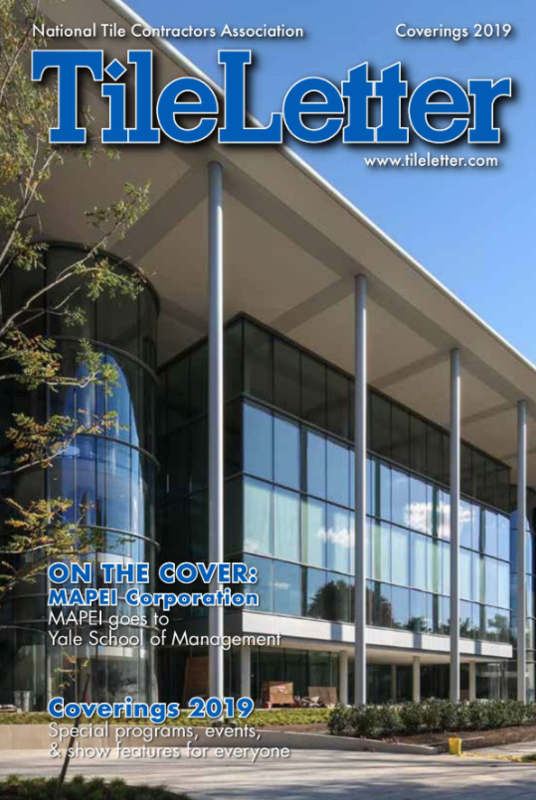 This issue also has useful recommendations for A&D professionals looking to align carefully chosen finishing products that will shine in their projects with installations that will stand the test of time, executed by qualified contractors. Contributors that made this issue possible include Lou Iannoco, who gathered information for products sections and wrote the Sales Report; Coverings Ambassador Alena Capra, who welcomes us to the issue and to Coverings itself; Joe Lundgren, who penned the tile trends story; Dal-Tile’s Roy Viana, who provides a window into what’s rolling in stone for 2018; Leatrice Eiseman and the folks at Pantone, who painted a picture of color palettes that will inform fashion and interior design this year; and representatives from Italy, Spain and Turkey who shared what factories in their countries are offering the tile industry this year. 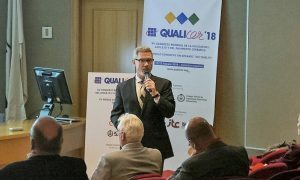 We also have a paper that Scott Conwell of IMI presented at Qualicer 18 in Spain in February, discussing the role of the architect as communicator and collaborator on ceramic tile installations, and a letter from NTCA president Martin Howard that will point you towards partnerships with knowledgeable, trained and skillful sales people and installation professionals to ensure successful projects. 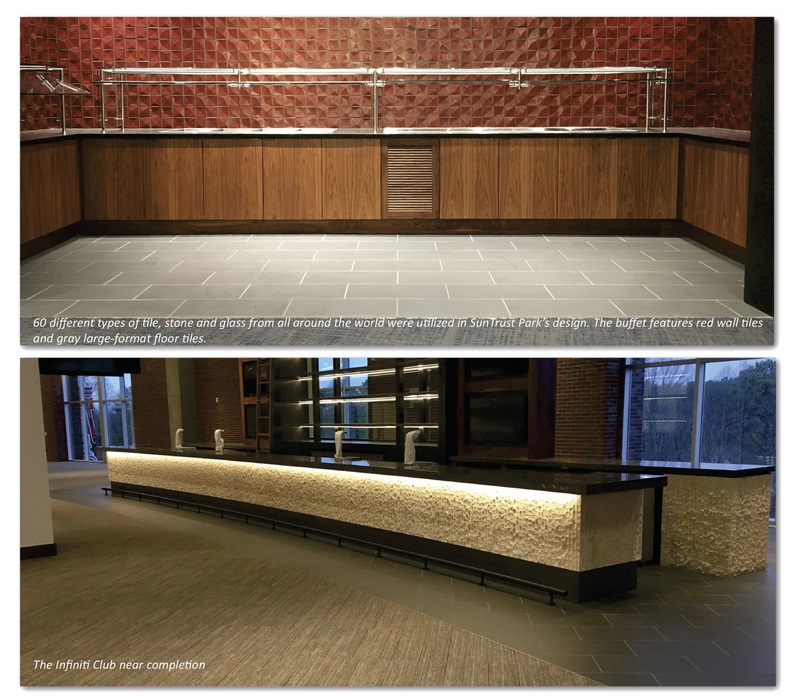 Our cover story hits it out of the SunTrust Park with an installation story about a homerun project by NTCA Five Star Contractor David Allen Company, using LATICRETE products. 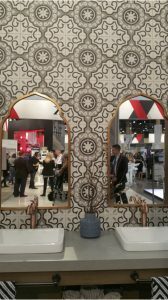 And speaking of products, the issue wouldn’t be complete without all the suppliers that contributed information about hot new products, many of which you can see at Coverings. Get ready to see these new styles, patterns, and products May 8-11 in Atlanta at Coverings 18. I’ll be there, and look forward to meeting you!